Stocks markets in the US, Europe, South America and the Asia-Pacific are all tumbling, fueled by fears of a global recession. The outlook for global economic growth appears dim, due to bad news from a number of fronts. In the US, factory activity in the Mid-Atlantic region fell, while US home sales unexpectedly fell in July and new claims for jobless benefits grew more than expected. In Europe, fears that the debt crisis could infect the region’s financial system resurfaced, also US federal and state regulators’ scrutiny of the US arms of Europe’s banks and some European banks’ higher interest rates for US dollar loans, led to worries about spillover of Europe’s debt crisis into the US banking system. The decreasing global consumer demand and markets contagion led to other markets’ falls. 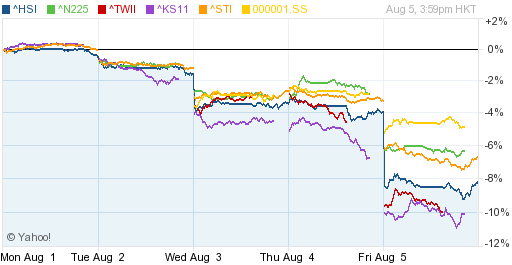 Stock markets are tumbling all over the world. Along the lines of my prediction in a recent post, stock markets in the US, Europe, Latin America & Asia, along with commodities markets, experienced significant declines. Wall Street suffered the biggest fall in two years, brought about by massive “sell-offs” by investors, triggered by “great fear” of a US recession, while European markets also fell significantly, driven by the sell-off contagion and worsening debt problems in Europe’s large economies, including Spain & Italy. 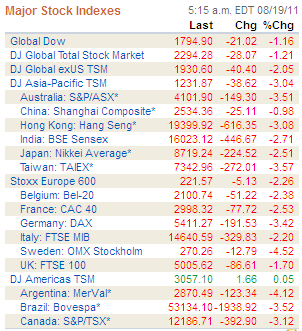 Latin American and Asian markets were not far behind either, as the sell-off continued on a global spree. 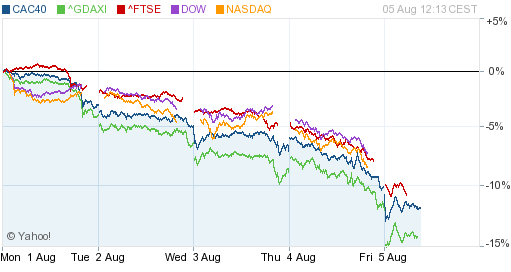 Global markets are on a downward slide. Stock markets across the globe are either falling sharply (indices in New York, London, Paris & Frankfurt are falling sharply as of writing this piece), or have closed lower (indices in Japan & Hong Kong). Meanwhile, Spanish and Italian long-term bonds are yielding their record highest – indicating a lack of faith in their sovereign debt by creditors. Also, gold prices have hit a record high, being considered the lone safe investment now. Having woken up from the keen focus on the US debt limit issue, global markets are now focusing on the general health of the global economy. The poor health of the US economy (slow service sector growth and falling factory order statistics being indicative), the ‘unbailably’ large economies of Spain and Italy, unrest & uncertainty in the Middle Eastern nations – are all compounding the concerns of investors and markets across the globe. Meanwhile, credit rating agencies Moody’s and Fitch have maintained their AAA rating for the US, albeit with a negative outlook on the ratings. The harsher S&P has not yet released their ratings. On the other hand, Dagong Global Credit Rating Company, China’s leading credit rating agency, has downgraded the US to A from A+ (which was, itself, a downgrade in Nov 2010). With the “Big Three” raters coming into frequent criticisms recently, rating agencies from developing economies are now gaining a stronger voice. Overall, all these developments are signs of tougher times to come. 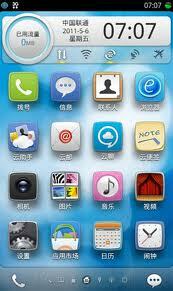 Global e-commerce giant Alibaba has just unveiled its new mobile device operating system – Aliyun OS. It has been developed by Alibaba Cloud Computing, a subsidiary of the Alibaba Group. It has been introduced as a cloud-based operating system, featuring cloud services including e-mail, Internet search, weather updates, mapping & GPS navigation tools. The cloud OS provides support for web-based apps as well, offering users an Internet-like experience that do not require the user to download or install application software on their mobile devices. Cloud OS users will be able to synchronize, store and back-up data such as contact information, call logs, text messages, notes and photos to the cloud and also access & update this data across all their PC and mobile devices.